LiPo batteries are a great way to power your projects. They're small, lightweight, and pack a pretty good punch for their size. Unfortunately, even the best batteries eventually run low on power and when they do it's often unexpected (and at the worst time). Don't be caught by surprise next time your board suddenly powers-down! 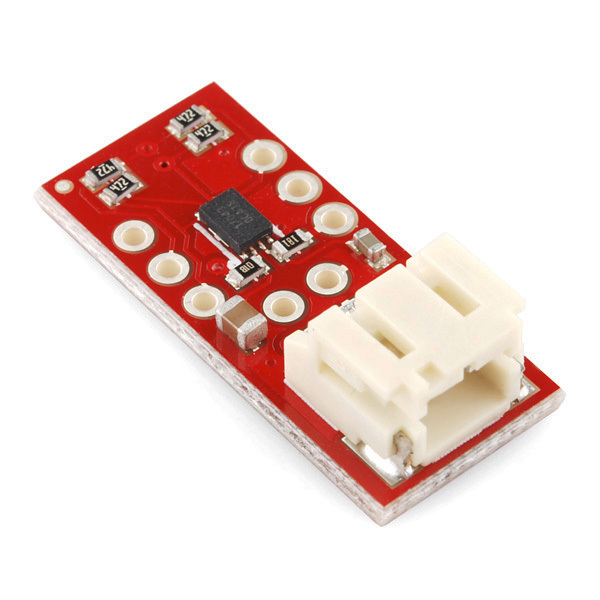 The SparkFun LiPo Fuel Gauge connects your battery to your project and uses a sophisticated algorithm to detect relative state of charge and direct A/D measurement of battery voltage. In other words, it tells your microcontroller how much 'fuel' is left in the tank. 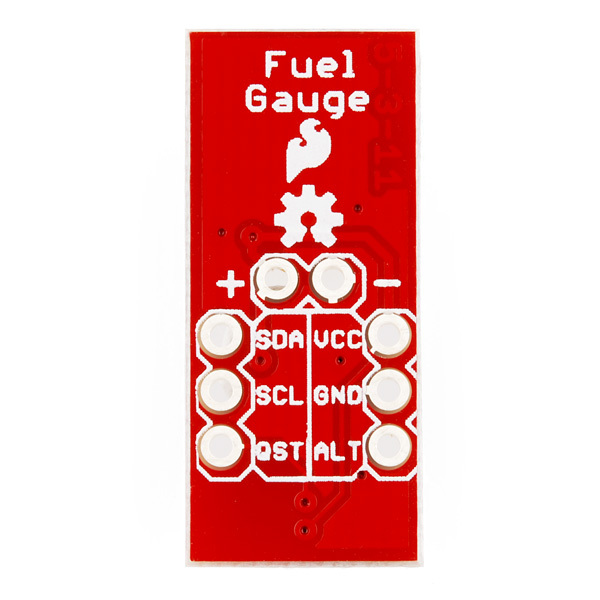 The LiPo Fuel Gauge communicates with your project over I2C and an alert pin also tells you when the charge has dropped below a certain percentage. We don't have an official library for the SparkFun LiPo Fuel Gauge, but this library and example code seems to work OK.
My low-power project draws 30 microamps or less, but when I put this in place, it draws 1mA - even when I put it to sleep. Posted details here: http://forum.arduino.cc/index.php?topic=581247.0 Any advice? Mine always reads 256% charge / 5 Volts. I'm guessing that I've hooked it up wrong. There are + and - pins; and there are also VCC and GND pins. Do I hook the LiPo to + and -? Then do I run my load from VCC and GND? Basically I'm looking for a hookup diagram. I've seen conflicting videos re: hookup. Thanks for any help. I finally got it working. It turns out all I needed to connect was SDA, SCL, and B+ and B-. Did not need to connect GND, VCC, QST or ALT to get the VoltageSOC example from Arduinolib_MAX17043-Master working. Do I need a 5v step-up with this to power the arduino? Are there any similar products to this that work with Lithium Ion batteries? I have several 12-Volt cylindrical-cell Lithium Ion batteries I would like to be able to get a fuel gauge for, but I haven't found any good ones. Do LiPo(s) and Li-Ion(s) function similarly enough that this would work for both? One of the best parts of SparkFun's designs is that there is usually a path to migrate from modules to an integrated system. The bummer about the MAX17043 is that it's non-stock from pretty much all the usual suspects: Digikey, Mauser, etc. Anyone know what's up with that? Is it end of life, is it that popular, or something else? If I had a 3S lipo, could I attach one sensor to cell #1, one to cell #2, and one to cell #3 to get a total combined capacity for the entire battery? so, when can we expect to see a Battery/Charger/fuel gage/current measuring/ boosting/with "system out" combo ? basically... a complete lipo solution package. i foresee power harvesting solutions.... spark fun... make this real! +1. nice to know how much juice is left, but then I have to plug the LiPo into another board to charge it? There are two separate pin headers where you can access the battery voltage. You can use one of them to connect a charger and, let's say, the other can connect to your system power. Now, these two headers, could I hook up the Sparkfun 5v boost thingy up to one, and the Sparkfun LiPo charger up to the other? Regarding the charger, would I be able to run the device directly off of the charger input with this setup? Yes, you should be able to do that. Check out the LiPower Shield for an example similar to what you are doing. Yes, I would also be interested in something like this! As of right now I'm taking pieces and parts from SparkFun boards to basically make this... Would be nice to have a ALL-IN-ONE Solution! Would anyone be interested in a complete system? Charger, Fuel Gauge, Boost / Buck Power supply, low battery protection? I am considering designing this and selling on sparkfun, just wondering on interest? Been looking EVERYWHERE for an integrated solution like this and I can't find a good one! This is a great opportunity for you Spark Fun! A one board complete battery solution - plug the battery on one end, then connect the device on the other! You have all the pieces, just put it together into one (very small) board! Another +1 on this. Building a robot boat here with 2S LiPo powering an RPi via 5V regulator. Need to know when the battery will run down. I tried to see who sources any of these ICs to maybe swap the 17043 with 17044 but only a single supplier (mouser.com) sources the 17044 and that only in BGA form MAX17044X. I think the part on the Fuel Gauge is not the BGA part so it would not be compatible, even if it could just be reworked. I had actually bought this for that specific purpose, but upon reflection had purchased the wrong design. this will work great for one portion of my project, but a multi cell gauge would work better for larger projects like UAVs or tanks. really need a more expansive model. could two of these be linked to create a 2-cell or 3 to make a 3-cell? SFE any word? I cut the track that joins the Cell positive to the Chip VCC and pull up resistors. The track is easy to find, when looking at the back of the board, with the "Fuel Gauge" text at the top, the track to cut is the one that runs around (from 12 oclock to 3 oclock) the CELL -ve pad in the center of the board and attaches to the VCC pad on the right side. Yeah the schematic was causing me to freak out (CELL and VDD tied with forced pullups? gonna kill my ÂµCU!! D:) Does cutting that trace keep the SDL/SDA pullups to VCC? So it just unties +/VCC? Matt - Has your code been tested with the MAX17043? I'm looking for a working project to talk to the chip, I'll pick up an Arduino and run your code if you know it works. Thanks. I have been using this module for a month now with no issues until now. For some reason it is reading a fully charged lipo (2000mah) incorrectly. After being fully charged it is only reading the battery as 80% charged. I've been using the same battery since day 1, and it's being used on a low drain system (1-3ma). More example code for Arduino => https://github.com/awelters/LiPoFuelGauge. So, if I understand correctly - this is intended as an "in line" solution - right? I put my battery into the JST connector, then I can power my project from the OUTPUT vcc/gnd, as well as use the I2C to measure my juice. Yes? Any concerns when the output vcc/gnd are not used? Or if I was wrong to begin with, what is up with those connections period? I got the LiPo Fuel gauge perfectly work on Arduino uno (SDA and SCL Analog pins 4 and 5, GND Arduino @ GND Fuelgauge). I also got it just work nice and fine on Arduino Mega ADK (as SDA and SCL are located @ PINS 20 ans 21). So now i want to connect two Fuel gauges on the Arduino Mega ADK .... Any ideas how i could do that? I'd use either a multiplexer to switch the data lines between the two cells or a software base I2C so you can just use completely separate pins. :D can i test it by simply wiring it to some DC power source? or it has to be a lipo batery? 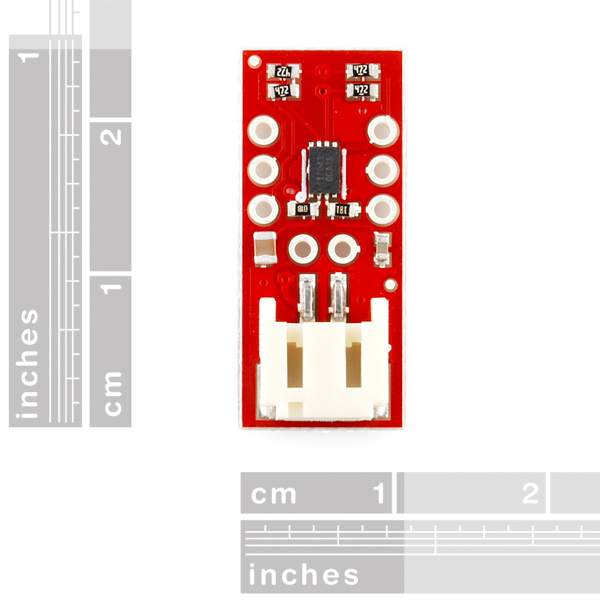 Does anyone have a Fritzing part for this? I've been trying without success to convert the eagle file to fritzing, and am close to just giving up and not incorporating this into the project. i'm using a tenergy 11.1V pack in a high-output LED light project; currently, i've got the logic side regulated down to 9V. i'm only looking to pull the bat% off the Maxim chip, so i had planned to plug this board in behind the regulator on the logic side (i.e. CELL = 9V). (?) Am I fouling up the Maxim IC by feeding it regulated power -- (or stated another way) -- can one use this board to gauge a pack >5V via regulating the incoming power? This should only be used with a single-cell Lithium-ion battery. Not a battery pack, and certainly not something as high as 9V. What if I need to use LiPo Fuel Gauge with this >> https://www.sparkfun.com/products/11360 battery pack as you see its complete with charging circuitry and all but I needed to also have the charge level read off it! is it fine. I see that this battery pack>> https://www.sparkfun.com/products/11360 uses a single cell LiPo so this would be fine with this LiPo power fuel gauge but what if I hack the battery pack and its too congested to access all the points to read the battery that I seek? Is there any limitation in the capacity of the battery? Alert Output. Active-low interrupt signaling low state of charge. Connect to interrupt input of the system microprocessor. So my question is what exactly do they mean? Is the line usually HIGH and when the IC detects an Alert it will turn the Alert line LOW? Here is a library I put together that has proven helpful to me: https://github.com/awelters/LiPoFuelGauge. Hope it helps others. It's a fixed address, so you'll either have to use a software IÂ²C library (.e. softi2c) to have things on a physically separate set of lines, or you'll have to switch between devices. There's specialized IÂ²C multiplexers, see e.g. http://www.kerrywong.com/2012/10/08/i2c-multiplexer-shield-testing/. You could also try making your own guage using a chip that does have selectable/settable addresses (I'm assuming they're out there). Any particular reason you'd want to have, and monitor, more than 1 battery on the same system? ah, same project as 4 months back, then :) Yeah, I'm familiar with the RC batteries (I fly a heli from time to time) - unfortunately I don't know of anything like this product, but for a 3S (or 2S, or 4S, etc.). There's a few chips from TI (probably Maxim as well) that could do the job, but you'd have to design a board around it, etc. The IÂ²C multiplexer approach could work for you. However, it may be easier to dig up a protection circuit (amazon, ebay, the usual, since that's your more immediate goal. Alternatively, you could try measuring the voltage of each cell directly on your arduino and do your own guesswork on 'charge', since that's what most of these ICs do (in a wide range of algorithms with trademarked names, though granted some also add ambient temperature and such into the mix), or just go by the voltage itself (cut off at 3.3V, 3.4V if on the cautious side). Perhaps somebody else knows of an Arduino-hacker-friendly multi-cell monitoring solution; looking at the comments, it does seem a common request (and by looking at the lack of answers, one perhaps not yet catered to). Is it possible to run this across a single cell of a 3S battery (using the balance connector) and use the reading as indicative of all 3 cells (i.e. multiply the reading by 3 to get the full voltage)? That's a tricky question to answer, The main reason for using a balancing charger in the first place is so that you don't get, say, 2 batteries at 3.4V and 1 battery at 4.3V and everything still looking fine at 11.1V total. The balancing charger will also help indicate when such a situation is more likely to occur because the batteries end up charging/discharging differently, and you might get a new cell (or typically a whole new pack). So if you put a monitor on only a single cell, you can't really be 100% sure that a reading on 1 cell is going to be indicative of readings on the other cells unless your balancing charger was quite recently used and indicated no problem. In that case I'd say it would be indicative..but still not a certainty. If you're trying to save money (or weight!) in a live monitoring case, perhaps it would be better to switch the fuel gauge to each cell independently, e.g. using an analog switch. This would require control circuitry (presumably that's not an issue given that the fuel gauge tends to be hooked up to a microcontroller anyway) and appropriate read-outs as well, though.. and I haven't checked to see if added resistance from said switch would throw off the monitoring. Anyone knows if this could be directly pugged to a SBC's I2C bus (Raspberry Pi, etc.) and be recognized out of the box by a linux driver? If not, is there such a board? Let me know if/when you find out. I want to hook this up to a dev unit which I've been told uses an LTC3576 for battery charging -- the contacts I get on the board are +, -, SCL, SDA, and TC (thermistor sense). It does not have a fuel gauge so I was thinking of hooking this one up to it - if I understand correctly, the SCL, SDA, +, and - pins on the gauge would go to the exact same contacts on the board, the QST can be connected to GND and ALT can be left open if I'm not planning on using those... It seems the VCC is connected to the + already, so does it make sense to not connect it to anything additional if I'm fine with it sipping the power there? Did anyone tried using it when running a Lithium Polymer battery while dischraging it on high current? When i am not consuming any current it look fine but when I'm discharging it at 20A-30A I'm getting strange results..
Digikey and Mouser no longer stock the MAX17043G+U, is there a good replacement IC I can use? They're still listed as active production... You should be able to buy them straight from Maxim at the above link. Where do I plug the QST into, when using Arduino? You could connect it ground or rest. Any chance of Just being able to get the IC itself? "Clearing the ALERT bit while SOC is below the alert threshold does not generate another interrupt. The SOC register must first rise above and then fall below the alert threshold value before another interrupt is generated." What does this mean exactly. What if say the SOC has a range from 0 to 100, 100 being fully charged and 0 is totally dead. If I write 4 if cases where I set the threshold alert levels to below, 100, below 75, below 50, and below 25. if the SOC first goes below 100, the FW then sets it to 75. If that statement is true, it has to rise above 100 and THEN go below to 75 for me to get another interrupt. Am I reading this right? I have been trying to use this device and still am having problems. I am using an Atmega328 at 3.3V, running at 8MHz and the example code from this page. I noticed in the schematic that there are pull-up resistors (4.7K) on the breakout board so I assumed that I do not need external pull-up resistors in order to use this I2C interface. Am I right? Has anyone else been able to get this to work with the example code? Also I have been searching for an Arduino library and example code without any luck. Has anyone found any working Arduino examples? From the datasheet and schematic I see a possible issue for 3.3V systems. They connected all the pullup resistors and the chips VDD to the battery voltage (labeled VCC), however Figure 7 in the datasheet shows the connections should be tied to the 3.3V of the microcontroller and isolated from the batteryâs voltage, which could fluctuate from 2.6V to 4.2V. I think this could mean up to 4.2V signal levels on the 3.3V chip, but Iâm not sure if this would actually cause a problem. Maybe try this out with a 5V Arduino? Looking at the signals with a logic probe or oscope might help. If I get I2C working on the datalogger (which runs at 3.3V) Iâll give this a try. Hopefully itâs just a code issue. I was about to use this with a 3.3V setup too when I noticed this problem. Odds are, if you are using this in a system, you're going to regulate the battery voltage, either up to 5V or down to 3.3V. Point being that by tying this board's Vcc line directly to the battery, its logic lines are going to vary with the battery voltage. This seems like a bad idea, IMHO. This IC should be able to handle up to 5.5V inputs, but check that your system can handle IO voltages from 4.2V down to ~2.6V. Note, ATmega640/1280/1281/2560/2561 doesn't like inputs above Vcc +0.5V. edit: I would recommend separating Vcc and Vdd from the battery voltage and letting the user connect them if they want. Otherwise, I need to cut traces on this board. I agree that the pullups are a little weird. The I2C pins are open drain output, and I'd expect the host to pull them up... though if you're using this in a standalone config (just using the alert pin), maybe the chip would freak out. And since they pull up the alert pin, I assume that's an open drain output as well. The pullups won't cause damage on most systems though, since the ESD diodes (present on most chips) will shunt the higher voltage, and the pullup resistors will limit the current. I think the VCC pin is dangerous though... if you didn't fully understand the documentation, most would expect to power the chip through the VCC pin, but in this case, you'd end up connecting your 3.3V rail directly to the battery pack. Or, in a worse scenario, connect it to your 5V system VCC and set your LiPo on fire. It's nice that you don't need to connect regulated power to this (the datasheet recommended configurations show powering directly from the battery), but you just need to be extra careful and read the documentation. I'm just gonna leave the VCC header pin unpopulated to remind myself to not use it. BTW, in regards to the comment on Figure 7, that's showing the 2S version (MAX17044), which needs a regulated voltage. They don't recommend a regulator for the 1S version (MAX17043)... though they don't explicitly recommend against one either. How about one for multi-cell packs? And I second mitpatterson suggestion of having LED indicators on board, 1 red, 2 yellow, 3 green (racing christmas tree style) with everything lit up when it's full and then progressivly turn them off as the power gets low, so the red is the last one to remain on. Does anyone know of a similar IC which performs the same functions as this MAX17043 but in a larger, hand-solderable package? Maybe like MSOP or bigger. 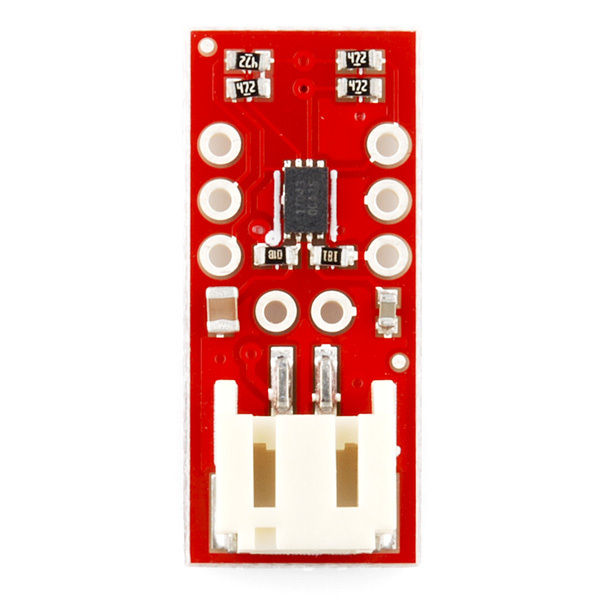 Can I connect this to the output pins of a PRT-10300 - Power cell lipo charger/booster and get the current state of charge? In other words, add onto the charger/booster abilities of the PRT-10300 by adding the ability to gauge the power that's left with this item? Can you charge the battery while it is connected to this? Like if I connect a battery to this, then this to an Arduino FIO, can I charge the battery through the FIO still? Only works with single cell lipos, from the datasheet. correct, we listed that in the features as well. Hi all, anyone has a library to implement PIC microcontroller and CCS compiler, please if someone has a different library of Arduino, and who can help me, I have several days trying to implement the circuit but I could not communicate with the PIC by I2C. I will try the spark fun code some other time. I did this in just 3 minutes an am in a hurry to get back to other projects. Thank you Spark Fun! I bought this to interface with the Sparkfun weather shield so that I could monitor my solar / LiPo powered outdoor weather station. Without this board, I was not effectively able to determine the charge state of my battery. I have so far tested it indoors (without solar cell) and it seems to be doing its job very well. Monitoring the true state of charge on a LiPo is no easy task, but this board seems to know what it's doing. As I test, I hooked up my weather station and monitored a 2Ahr cell for over 24 hours, watching the charge state go from 90% to about 66% which is very believable given what I know about the station current draw. Pretty nice $10 add-on for my weather station. Using it on a Cypress app and seems to do its job. It would be useful to breakout the 1k battery sensor from VCC. In my application I'm using one of these with a particle io photon. The vcc for the particle is 3.3v but the battery can range from 3.2 to almost 4 volts so they need to be separated. It would also be helpful to have the battery through holes in line with the other through holes. These batteries are good at one thing, powering that circuit. But unlike a motor vehicle they can't tell you when a fill is needed. That can. My only gripe is one of, "Why is AVR code shown?" Using this in a homemade remote control to monitor the LiPo battery. Works as described and I love the I2C interface - saves me some pins for other things. Excellent - would recommend for anyone wanting to check on charge/voltage (static use) or monitoring (dynamically, in-circuit)!